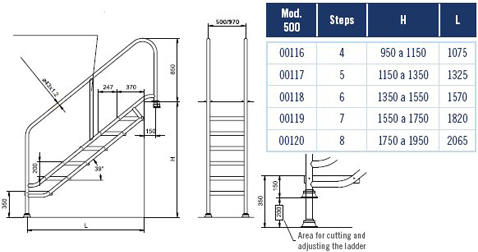 These stairs are designed for ease of entry into exercise or hydrotherapy swimming pools where lifts are not required. These stairs are made from AISI-316 stainless steel tube with plastic non-slip treads, the distance between handrails is 500mm. These stairs are easy to install and come complete with fixing anchors.